Water Street Home Ten Extra Water Days – What Are You Doing March 41st? 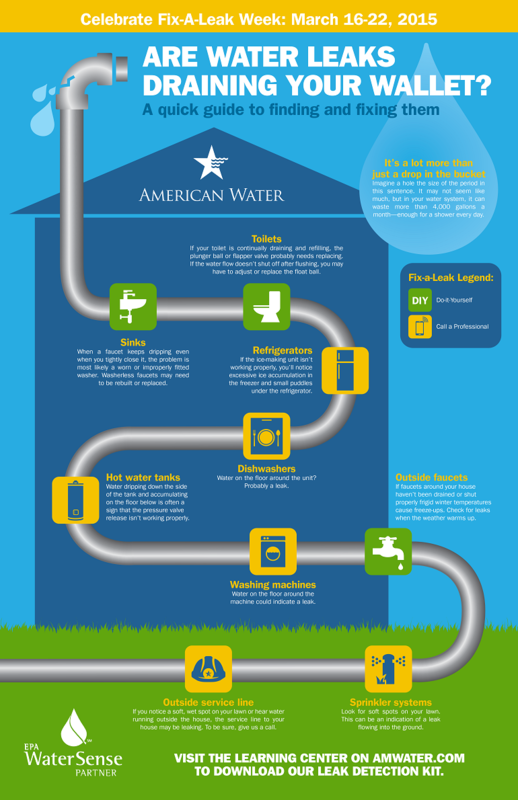 March 16-22 marks the annual Fix a Leak Week, a wonderful awareness initiative presented by the U.S. EPA and their WaterSense® partners. But before exploring the actions we’re called to take in honoring Fix A Leak Week, I’d like to consider for a second the fictional week you could be gaining March 32-41. Wait a second, March 41st?! Is that a Saturday? We all know the standard March calendar ends on the 31st. But I ask you to think about ten extra days this month to illustrate a vital point: in the course of a month your household could gain an extra TEN “water days” simply by finding and fixing a miniscule water leak. A leak as small as this period: “.” in your water system can waste more than 4,000 gallons of water a month. And with the average household using 400 gallons of water a day, well, suddenly that insignificant leak suddenly isn’t so insignificant – it’s wasting about 10-days worth of water every month! 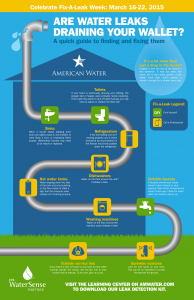 Fix a Leak Week 2015 sets out to inspire everyone to do their part by “chasing down” leaks and taking the steps necessary to fix the issues that currently waste more than 1 trillion gallons of water annually nationwide (and this figure is for household leaks alone!). Communities throughout the country are employing highly creative strategies to get people excited about and involved in the mission. 2015 Fix a Leak Week events range from do-it-yourself clinics at local hardware stores, to social media contests rewarding photos of “leak detectives” in action, to my personal favorite for creativity, The Charlottesville Fix a Leak Week 5K which, among other attractions challenges participants to catch the leak by overtaking a literal running toilet! Just as that one tiny pinhole leak can have a major impact on your water consumption (10 extra days worth a month! ), each household taking a little time as part of a united effort to heed the call of Fix a Leak Week can really add up as well. Every leak detected and repaired is another step forward in rescuing the 1 trillion gallons of water wasted per year, and restoring the health of our precious water resources.